When the Pet Shop Boys wrote tracks for Kylie Minogue a couple of years ago, they did not get so much as a ‘thanks but no thanks’. ‘We never heard anything back,’ explains Neil Tennant. ‘I think every songwriter in London wrote songs for Kylie’s last album. They did not know it at the time, but being blanked by Kylie was a blessing in disguise. The Boys kept one of her songs for themselves, and the process of penning potential hits for Kylie inspired them to write some of their most poptastic material of recent years. ‘I think that got us into the framework of writing very poppy uplifting songs, which we haven’t done for a while,’ says Tennant. The result is Yes, the pair’s 10th studio album, which follows their outstanding contribution honour at last month’s Brit Awards. That accolade recognised a 25-year career that has produced 21 top 10 UK hits, including four number ones, and has seen them sink their ambitious artistic instincts and downbeat disco anthems into modern culture. 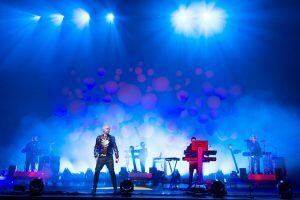 Since the 1980s, when the Pet Shop Boys helped draw the electro-pop blueprint, the pair have stayed together, tried projects from stage musicals to film soundtracks, and strived to take their songs somewhere new. ‘The songwriting process is the same, but the songs have maybe got more complex over the years,’ explains Lowe, who says the duo consider themselves writers rather than pop stars. To stay at the front of the pop pack, they went to the hitmakers Xenomania – who have crafted smashes for Girls Aloud, Alesha Dixon and Gabriella Cilmi – to produce and co-write Yes. They are ‘the best pop producers in Britain at the moment’, according to Tennant. ‘They don’t just sit on their laurels,’ the singer says. ‘They’re always trying to do something different. Xenomania’s influence is most apparent in the heightened, pulsing beats and shiny, space-age sheen that see the Pet Shop Boys keep in touch with the current sound. Their enthusiasm to capture the zeitegist can be a little dazzling, as in the football chant chorus and relentless rhythm of the opening track Love Etc, followed by All Over the World, with an opening that brings Tchaikovsky into the nu-rave age. When the album settles down, the production touches become more subtle and more of the Pet Shop Boys’ personality is allowed to shine. The duo have not lost their melodic intuition and the first half-dozen choruses are consistently catchy. Five tracks in, Vulnerable lets a familiar, bittersweet shade of dancefloor dejection seep through. That, coupled with one of the most hummable hooks, makes it the low-key highlight of the album. Kylie Minogue also had another influence on the album, the singer says. Tennant’s personal favourite track, slightly unfairly stuck at the end of the weird side, is The Way It Used To Be. ‘It is almost like a film the way it’s structured – a man and a woman meet after many years and then we have a flashback to when they first lived together and it goes through their whole relationship and then suddenly they meet again,’ he says. Although their new material is only just out, the Pet Shop Boys have already tasted chart success this year – as co-writers of Girls Aloud’s top 10 single The Loving Kind. ‘It was a song we were writing for ourselves with Xenomania and we decided it wasn’t quite right for us,’ Tennant says. So Xenomania boffin Brian Higgins asked if he could give it to the girls instead. Kylie’s loss was Girls Aloud’s gain, and the Pet Shop Boys are now aiming for a return to the charts in their own right.